Our Glare Jacket is a Women’s Long Down Jacket with an absolutely modern and contemporary spirit. The outer fabric is made of water-repellent and windproof nylon, with a super-glossy and modern look. The direct injection padding in 100% real down (of which 90% white duck down and 10% feather) makes the garment extremely soft and pleasant to wear. The fit is feminine and screwed, but easy enough to be able to dress well different body shapes. Garment equipped with all the comforts needed: a useful hood with fur insert on the edge, a high neck to cover from winter breezes and low temperatures, and practical windproof elastic cuffs. Concealed side pockets and two inside pockets covered in contrast with original RefrigiWear black/silver insulating and breathable fabric to safely store all of your personal items. Classic metal logo plaque on the left arm. Extremely versatile garment, ideal to take with you on a trip, considering its lightness and practicality, or for a walk in the city. Suitable for cold and wind resistant temperatures. Wear it for formal occasions or even with a more casual look. Buy it today in Black or Dark Blue. This super-glossy Down Jacket offers an unmistakable look, ideal for those who love a contemporary, always trendy and modern style. The quilt is horizontal and typical of down jackets, with the difference that on our Glare Jacket it is slightly oblique, thus proposing a greater movement and a perfect rendering on the shapes of the body. The 100% real down padding makes the garment extremely manageable, light and comfortable, but at the same time guaranteeing the warmth and protection needed to face at the best the Fall Winter 2018 season. 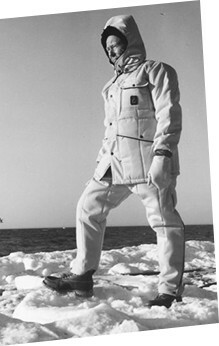 This padded parka forms geometric lines giving the garment a strong attitude, and is perfect to combine with a multitude of different looks: wear it over a sweater and a jeans for a casual look; use it during a walk in town with friends: in this way you will always stay warm, without having to carry around an excessively heavy garment and therefore always staying very comfortable; take it with you for a week or a mountain vacation weekend, you will be able to fold it and put it in your baggage in a practical and convenient way. Another peculiarity of this garment is the outer shell fabric, with an extra shiny look, which offers a modern and never predictable look. This long down jacket is researched to the last detail: the front closure is with zip and double slider, the cuffs are elastic and the collar is high for maximum protection from wind and rain, the hood is fitted with fur on the edge for an impeccable style. Classic metal logo plaque on the left arm. Suitable for cold and wind resistant temperatures. Wear it for formal occasions or even with a more casual look. Buy it today in Black or Dark Blue. The fit is screwed and feminine, but at the same time comfortable and modern. Extremely soft feeling. All RefrigiWear garments are to be treated with care; correct treatment will guarantee the maintenance of performance and appearance over time.